Contractor: Gordon Jones Construction Co.
Building Materials/Description: Three-story dark brick building with balconies, Spanish tile roofs, and towers with parapets creating a curvilinear silhouette; limestone base and details. 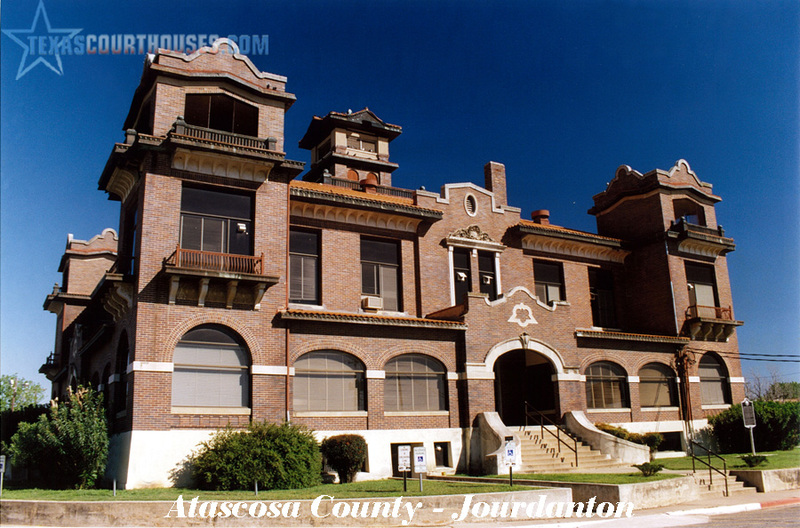 Architect Henry T. Phelps designed the Atascosa County Courthouse for the newly designated county seat at Jourdanton, just south of San Antonio. Completed in 1912, the brick and cast stone building incorporates the characteristic features of the Mission Revival style, including curvilinear parapets, arcaded loggias and pyramidal tile roofs. Still a dramatic landmark in the local setting, the courthouse occupies a circular plot in contradistinction to the typical Texas courthouse square. Despite modifications such as changes to its fenestration, the building retains a high degree of its integrity of location, design, setting, materials, workmanship, feeling and association. Rising dramatically from generally flat topography, the courthouse is centered in a circular plot at the intersection of the town’s historic arteries, Main and Campbell streets (see Map-18). The elevation facing Main Street (northeast) originally served as the main entrance, although construction of State Highway 97 on the south reoriented the primary approach to the southeast. Two cross corridors leading from four identical entrances divide the courthouse’s square plan into four office areas (see Plan-22). Stairs in the center of the building and an elevator installed in the 1970s provide access to the upper floors. 3-story towers at either end (see Photos 1-4). The 2-story mass of the building steps back from the first floor loggias to a steeply pitched roof that stretches upwards to a central tower. Curvilinear parapets above each entrance and its corresponding second floor windows provide the focal point at the center of each elevation’s composition. Decorative cast stone surrounds contribute to this emphasis. Despite the replacement of the original 1/1 wood casement windows and transoms with 1970s aluminum windows, the facade retains its overall rhythm. The battered walls of the basement are of concrete covered with plaster to imitate limestone. Containing two sets of casement windows on either side of each entrance, this area was originally open. The county enclosed these openings in the late 1920s to create more office space in the basement. An arcaded loggia encircles the first floor, with its shed roof of clay tile visually unifying the first and second floors. Originally open (see Photo-26), it too was glazed in the 1920s to gain additional office space. Splayed steps lead to the main entrance through the center archway, emphasized by a cast stone surround, a decorative quatrefoil, and a scalloped gable. The second floor is also comprised of five bays with an a-b-c-b-a composition. The central window over the entrance projects slightly from the wall. A shaped parapet containing an oval vent and a decorative window surround echoes the composition of the ground floor. Four towers capped with scalloped parapets punctuate the corners of each facade. These 3-story towers are capped with a flat, built-up roof. Enclosed arched windows on the ground floor are intersected by a cast stone string course whose line is carried through the ground floor loggia. The second floor windows feature wrought iron balconies supported by cast-stone brackets. A frieze of Sullivanesque ornament is located under each of these balconies. The bracketed cornice of the second floor is carried into the third floors of the towers where it supports a wood railing. The slightly pointed arched openings, originally open, are now enclosed with plywood. The hipped roof of terra cotta tiles rises to a central tower, capped with a hipped and gabled roof. Two arched windows on each side of the tower support a cornice surmounted by an open area with brick piers. This central tower of somewhat squat proportions continues a tradition of courthouse design begun in the 1890s. Despite alterations over the years, the building retains all of its character defining Mission Revival elements. Initial alterations in 1927 glazed the ground floor loggias with steel sash windows and enclosed the open basement. In 1958 Marvin Eichenroht of San Antonio supervised changes including the reconfiguration of the steps, installation of aluminum and glass doors, placement of wire mesh over the towers to unsuccessfully discourage pigeon roosting, and the addition of air conditioning which included a large condenser on the east lawn. The tile roof was originally a darker color, perhaps green, but about 1987 orange tiles were installed. The eight windows of the central tower are currently boarded up to prevent water incursion, but plans call for the repair of these windows. Installation of a modern flag pole and a historical marker on the grounds also occurred after the period of significance. Such minor changes only minimally affect the integrity of the building’s materials, leaving intact its integrity of location, design, setting, workmanship, feeling and association. The most serious alteration, however, occurred with the replacement of the original windows with bronze anodized aluminum windows and dark tint glazing installed in 1976 by Johnson-Dempsey and Associates, Inc. (an elevator was also installed at this time). Installed without the proper review by the Texas Historical Commission, a lively correspondence between the architects and the agency ensued in which the architect claimed that the “detailing which may be of interest and great charm to historically oriented persons is of little importance to the laymen on the Commissioners Court.” The current Atascosa County Commissioners Court intends to replace the aluminum windows with wood sash windows according to the original plans. Funds have been budgeted for this replacement and work should begin soon. In addition, plans include restoration of the central tower, repair of the widow’s walk of the central tower, and roof replacement. Installed within the casings of the original fenestration, the new windows maintain the historic rhythms of the original composition. While unfortunate, this type of alteration remains common in Texas’ public buildings such as courthouses and schools. As a result, this type of change need not adversely affect the integrity of a historic resource with both historical and architectural significance. National Park Service guidelines note that “a property that has lost historic materials or details can be eligible if it retains the majority of the features that illustrate its style in terms of the massing, spatial relationships, proportion, pattern of windows and doors, texture of materials, and ornamentation (National Register Bulletin 15: How to Apply the National Register Criteria for Evaluation, p.46). In addition, “the rarity and poor condition of other extant examples of the type may justify accepting a greater degree of alteration” (op cit, p. 47). As the Atascosa County Courthouse retains all of its characteristic Mission Revival features, it continues to convey its significance as the only surviving example of this style in a Texas courthouse. Architect Henry T. Phelps of San Antonio designed this Mission Revival courthouse as the result of a controversial move of the county seat to Jourdanton in the early years of the 20th century. Completed in 1912-13, Phelps’ design created an outstanding example of the style. Few Texas courthouses exhibit elements of the Mission Revival style, with this the only surviving example in the state displaying the full range of features associated with the style. The building continues to serve as the focal point of county politics and government, a role it played with distinction throughout the period of significance. Evaluated within the context of Courthouses in Texas: 1845-1950, the property is therefore nominated at the local level of significance under Criterion A in the area of Politics/Government and at the state level of significance under Criterion C in the area of Architecture. Atascosa County lies just to the south of San Antonio and Bexar County (see Map-17), within the Rio Grande Plain region of south central Texas, more commonly known as the Brush Country. Native Americans of the Coahuiltecan language group originally occupied this arid region, although they were annihilated by disease and invasion by Comanche and Apache following the arrival of the Spanish. The name was derived from the Spanish verb atascarse, meaning to mire or to bog, in reference to the area’s sandy soils, first described by the Spanish in the 18th century. When wet, these soils posed difficulties for early travelers, whose horses and wagons often bogged down in the area. According to local historian C.L. Patterson, however, General Alexander Somervell actually named the area when his forces encountered quicksand along the Atascosa River during his invasion march to Mexico in October 1842 (Patterson, n.p.). Permanent settlement in the area dates to the mid-18th century, when the Rancho de Atascosa served as the ranchero for missions San José and San Miguel de Aguayo. With the secularization of these mission lands, affluent Hispanic families from San Antonio de Bexar established private ranches in the area. Among these, José Antonio Navarro owned four leagues along the Atascosa River granted to him by the Mexican government in 1825 (Peterson, 273). While many of these early ranches were broken up during the Texas Republic era, the first Anglo setters did not arrive until Texas began issuing land patents in the area to veterans during the late 1840s (Peterson, 273). Navarro’s original holdings were acknowledged by the state in 1853, followed by the creation of Atascosa County from Bexar County in 1856. Named in honor of Navarro, Navatasco (later called Amphion) was established as the first county seat in 1857. These developments marked the beginning of extensive settlement in the area. The first census of 1860 recorded a population of 1,578 (including 84 slaves) and 3,397 improved acres contained on 102 farms in the new county (US Census, 1860). Subsistence farming and cattle ranching characterized the local economy throughout this period (Peterson, 273). While cattle ranching continued as a significant component of the local economy following the Civil War, towns created by the railroad and land promotion schemes transformed the area during the late 19th and early 20th centuries. The inauguration of rail service by the Great Northern Railway in 1881 spurred an influx of population, which doubled to 6,459 by 1890. Most of these new settlers farmed the area’s rich soils, prompting a tenfold increase in the number of improved acres to 50,534 in that year. By the turn of the century cotton dominated agricultural shipments from the county, reaching annual production figures of 4,799 bales in 1910. The introduction of improved irrigation techniques during this period also fostered the development of markets for strawberries, peas and watermelons in the county (Tyler, 273). These developments also effected tremendous change in the county’s built environment. Early courthouses had been rudimentary affairs, including a log building erected in Amphion and a modest frame building raised in Pleasanton (Kelsey, 37). Built at a cost of $170.50 (Metcalfe, 6), the latter 20 by 30 foot building subsequently served as a school facility which school trustees rented for $15 a month (Welch, 272). The next courthouse, built in 1868 at a cost of $623.80, was a simple frame construction measuring 40 by 25 feet (Metcalfe, 6). In 1885 county officials finally authorized expenditures totaling $15,850 for a permanent courthouse. The resultant red stone building featured Italianate style ornamentation and a mansard roofed tower (ibid). Subsequently used as the city hall for Pleasanton, it ultimately was demolished in the 20th century. Founded in 1909 by Jourdan Campbell and Colonel T. H. Zanderson to promote irrigated farmland in the area, the town of Jourdanton typified the role of entrepreneurship in the development of rural lands in the region. The developers soon realized the importance of providing a transportation link between farmers and the markets in San Antonio. When the Artesian Belt Railroad announced its intention to build through Atascosa County, Jourdan Campbell offered $50,000 and half of the new townsite to ensure rail service. As Pleasanton lacked the resources to compete with this offer, the new rail line bypassed the existing county seat in favor of the upstart community. As a result, Pleasanton lost its competitive edge until it too was linked to San Antonio via the Missouri Pacific Railroad two years after the fateful election. Within a year of the new town’s founding, local citizens petitioned for the relocation of the county seat to Jourdanton. Publicly, the town’s proximity to the geographic center of the county and access to rail service fueled this effort, although Campbell’s political influence certainly fostered the campaign. Out of 1,387 votes cast on 1 October 1910, 665 favored retaining Pleasanton as the county seat, while 722 backed relocation to Jourdanton (Atascosa County Commissioners Minutes, 23 November 1910). As the state constitution required a two-thirds majority vote to move an extant county seat if it was within five miles of the county’s geographic center (Robinson, 79), this close margin precipitated an injunction filed in November 1911 to prevent the relocation. Pleasanton merchants W.A. McCoy, J. Henry Smith and James M. Galloway led this legal effort to retain the status quo, maintaining that the election was called illegally and that Pleasanton’s location triggered the constitutional stipulation. The plaintiffs filed in district court, appealing the case all the way to the Texas Supreme Court. By late November, however, the plaintiffs and the Commissioners Court settled out of court. Their agreement contained a clause stipulating that the old courthouse would be leased to the Pleasanton School District (Atascosa County Commissioners Minutes, 25 November 1911). According to contemporaneous newspaper accounts, this resolution allayed concerns over continued public access to free water available from the well on the county’s property in Pleasanton. With resolution of this challenged the Atascosa County Commissioners Court, including county judge W.M. Abernathy and commissioners T.D. Harrison, Wm. Krisch, J.W. Crouch and W.J. Campbell, turned to the task of erecting a new courthouse. The county’s attorney, C.C. Clamp, urged the county to “Build Well, that future generations may say that their forefathers were men of wisdom and judgment…You will find that the public buildings of a county are measured as an index of the prosperity of that county.” (Atascosa County Commissioners Minutes, 25 November 1911). Within a few short months the county commissioned plans for a building costing an estimated $75,000 from architect Henry T. Phelps of San Antonio (Atascosa County Commissioners Minutes, March 1912). In June 1912 they awarded the building contract to the Gordon Jones Construction Co. of San Antonio, based on a bid of $65,000. As general contractor, the firm agreed to finance the project at 6% per annum interest based on a 15-year repayment schedule. The commissioners also authorized payment of Phelps’ architectural fee (5% of the gross cost of the project) in installments at the awarding of this contract, with smaller payments due upon completion of the walls to the roof line and final completion of the project, scheduled for 1 March 1913. A special tax of 15 cents per hundred dollars of taxable property in the county, estimated at $7.6 million, underwrote costs associated with this construction project (Atascosa County Commissioners Minutes, June 1912). By the completion of the new courthouse, Jourdanton boasted a public utility company, telephone exchange, two hotels, a bank, gin, newspaper, public school system, two churches and a variety of commercial establishments including restaurants, general stores and lumber yards. 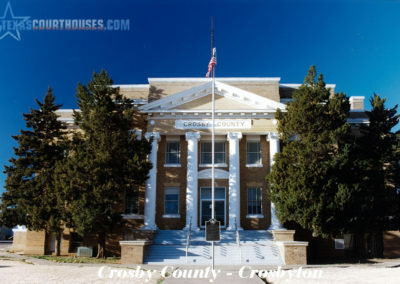 The new courthouse became the center of the fledgling community, hosting a variety of public events such as the Atascosa County Fair and local commemorative celebrations. It also served as the focus of the county’s political arena, with interaction between the landmark and county citizens dominating local politics throughout the period of significance. During this period, county courthouses often represented a citizen’s most direct chance to interact with government in the state. As the seat of district and county courts, the courthouse provided the setting in which people resolved their differences and filed their most precious documents, including titles to their land, probate documents and marriage certificates. The theater of commissioners court provided a measure of entertainment for citizens as well as direct participation in the weighty issues of the day. As the precinct polling place, the courthouse hosted many political events through the years, including watershed moments such as the 1919 special election on the prohibition amendment (Atascosa County Commissioners Minutes, 24 May 1919). Highly visible among the low-scale buildings of Jourdanton, the Atascosa County Courthouse is prominently sited on Circle Drive off Texas Highway 16. Although each facade is identical, the main entrance originally faced the commercial establishments along Main Street (see Photo-25). Unlike the more typical Shelbyville square surrounding most Texas courthouses, however, a Lancaster plan type provides the setting for the courthouse, with major streets converging on axis with its principal elevations (see Map-19). This type of plan emphasizes the importance of the courthouse as the center of the town and accentuates its monumentality. The courthouse square in Grimes County (NR 1974) is one of the few other examples of this plan in the state. The decision to move the courthouse to Jourdanton created the need for a public square within the previously platted community. The commissioners court selected a site at the intersection of the town’s principal streets, carving additional road easements from the surrounding four blocks (Atascosa County Plat Records, volume 52, pages 177-78). The resultant circular setting created one of the most distinctive courthouse “squares” in the state. San Antonio architect Henry Truman Phelps (1871-1944) designed the Atascosa County Courthouse, as well as the subsequent county jail (1913). He was also responsible for the depot (c.1913; now demolished; see Photo-28) in Pleasanton and numerous courthouses around the state. Phelps was born in Anaqua Texas, the son of Edwin and Mary Jane Phelps. By 1891 he was in San Antonio working as a draftsman in various architectural offices. He served in the Spanish-American War in the 1st Texas Volunteer Cavalry. Soon after his return to San Antonio, he opened his own office with Solon McAdoo in 1902. Phelps’ partnerships rarely lasted very long, however, as he was on his own in 1903 and a later partnership with D.R. Jacob also lasted only a year (1909-1910). Among his work in San Antonio are designs for the Kampmann House (1922), the J.M. Nix House (1923), the Nix Professional Building (1929). A member of the San Antonio Club, the International Club, the Texas Society of Architects, he also served as director of the San Antonio Municipal Airport in the 1930s. He died of a heart attack in 1944. Phelps designed numerous county courthouses throughout Texas during the first three decades of the 20th century. His first such design for the Frio County Courthouse in Pearsall (1904; modernized c.1930) ornamented a classical plan with simplified Romanesque detailing such as arched corbel tables and a hipped roof clad in tile. He continued this tradition with the Terrell County Courthouse (1906) in Sanderson, once again combining modest Romanesque detailing such as hipped roofs, towers and arched corbel tables with a classical plan (see Figure-24). 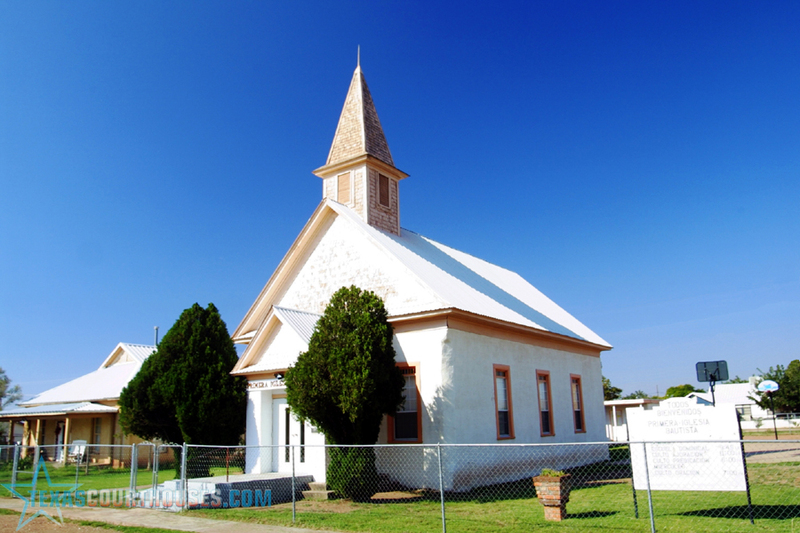 These precursors to the Atascosa County Courthouse indicate the nascent development of Phelps’ distinctive approach that culminated in the full blown Mission Revival style courthouse in Jourdanton. He afterwards shifted his emphasis to more classical design elements, often basing subsequent courthouses on rectangular plans with classical ornamentation such as colossal order columns and pedimented entries (typically incorporating a clock). These classically inspired designs included courthouses for Mills County in Goldthwaite (1913), Jim Hogg County in Hebbronville (1913) and Blanco County in Johnson City (1916). His 1920s courthouse projects continued to couple Beaux Arts planning tenets with classical ornament, as seen at Kenedy (1921), Schleicher (1924), Uvalde (1927) and San Patricio (1928) counties. By the late 1920s, however, Phelps designs reflected the influences of the Art Moderne style. While he continued to base his designs on classically derived plans, courthouses from this period such as those at Kimble County in Junction (1929) and La Salle County in Cotulla (1931) featured reductive ornamental vocabulary expressive of a new era. The Mission Revival style grew out of the late 19th century rediscovery of the California missions, which were popularized and romanticized through literary works such as Helen Hunt Jackson’s Ramona (Gebhard: 137-38). Journalistic coverage brought national recognition to the California Building at the World’s Columbian Exposition of 1893, with its combination of Beaux Arts planning tenets and architectural motifs drawn from the historic missions. San Antonio architect James Riely Gordon experienced this building first hand while overseeing construction of the Texas Building at the Chicago fair. He in turn designed one of Texas’ earliest examples of the style for Waco’s Cotton Palace (now demolished), completed in the following year. The style eventually achieved prominence in the state as architects sought inspiration from the region’s Spanish Colonial heritage. The struggle to protect San Antonio’s missions in particular stimulated public interest in creating new applications for the architectural imagery of these romantic landmarks (Weddle, 33). Among the most common examples of the style in the state, railroad depots such as the Southern Pacific Railroad Station (1902; NR 1975) and the International and Great Northern Railroad Station (1907; NR 1975), both in San Antonio, helped popularize this regionally appropriate style. The Atascosa County project represents Phelps’ only use of this style on a courthouse, although he employed it frequently in designing projects ranging from the Missouri, Kansas & Texas Depot (1909; NR 1983) in Dennison to the City Hall and Fire Station (1912; NR 1988) in San Angelo (Long, 180). The Mission Revival style was deemed particularly appropriate given the county’s connection to the cultural heritage of San Antonio’s Spanish Colonial mission system. Moreover, its similarities to his design for the Pleasanton depot visually reinforced the significance of the rail system to the creation of the new county seat in Jourdanton. Phelps’ previous courthouse designs in the Beaux Arts tradition are reflected in the parti (design concept) of the Atascosa County Courthouse despite the Mission Revival imagery of its exterior. More apparent, however, is the application of a picturesque style, whose historic sources were asymmetrical in both plan and elevation, to a facade utilizing a strict symmetry. The four identical facades prevented the building from dominating only one side of the square. The building also contains design elements inspired by the Chicago School, including panels of Sullivanesque ornament beneath each of the tower balconies. The Atascosa County Courthouse survives as the only extant example of the Mission Revival style as applied to a courthouse, and is thought to be the only such courthouse built in the state. Other courthouses from the period feature Mission Revival details, such as those designed by Atlee B. Ayres of San Antonio for Kleberg (1914) and Refugio (1919) counties. These designs, however, only reference the style through their Mission Revival parapets, as classical and Prairie style features dominate their compositions. As the design of the Atascosa County Courthouse incorporates all the hallmarks of the style, it is therefore nominated at a statewide level of significance in the area of Architecture. Continuing to provide the focal point of political activities in the county, it is also nominated at the local level of significance in the area of Politics/Government. With restoration plans currently underway, it should continue as a landmark of the region’s architectural heritage worthy of C.C. Clamp’s exhortation to build well for future generations.